“Sleep is the best meditation” Dalai Lama – that is what we found on a little card on our pillows when we arrived at our hotel in Barcelona. two double beds.. Then it was time to search for lunch/dinner. Getting with the Barcelona atmosphere we sat outside in the outdoor dining area on Rambla Catalunya and dined. Paella, garlic mushbrooms, pesto ravoli. Such beautiful food. We will enjoy our stay in Barcelona. We are again back in the hotel room with sore legs. Yesterday, was the Louvre. In the queue early and then raced to see Mona Lisa before the hordes. Only about 20 in front of her when we got there. I hate to think what it was like when the Japanese & American tour groups arrived – we saw them heading there later. Extremely impressive building. I took so many photos my camera battery died and I felt lost. We did the old Greek, Roman & Egyptian stuff which was our interest – way to much to look at, you would need several days. Then on to Notre Dame then eventually to the metro station. Today a bit slower start to the day and on the metro to experience the real Paris. No one smiles – feeling sad! Sitting outside the French Cafe – Amelia and I watched the people of Paris and the tourists go by. We all thought that Paris would have a high standard of dress. As you can gather we saw it all. It was very nice taking time out to do what you do in Paris – eat, drink and watch the people go past. Packed, as in the morning we will be off to Barcelona by train. Early start – departing 6.30am. Note: I plan to do a catch up post on London – as it will be good to keep a record. Each day we do so much, that this will be a great place to look back at. My goodness, we are making the most of our time and we are already in Paris. We arrived yesterday coming from London on the Eurostar. A great experience going under the English Channel and through France to Paris. It was good we had someone to meet us at the train station. Speaking French is a challenge to us!! We look for the items on the menu with words in English and know they will be friendly and understand our requests. This was our first full day in Paris and we went on an organised bus trip. We had to go on the Metro and lucky for us we had someone help us buy our tickets yesterday. So with a bus load of people we visited the Eiffel Tower and also a Seine River Cruise. Wonderful trip and amazing transfer of knowledge of the important parts of Paris. We have plans for a visit to the Louvre tomorrow. Watching French television is ffrustrating – can’t understand it at all. You might have guessed that Amelia has struggled to do the blog as at the end of the day she is wiiped out – lots of walking and seeing as much as we can. Therefore, I will attempt to blog when I get a chance as we have some amazing experiences to have. Internet is not at its best so hopefully more soon. Writing isn’t part of every editor’s job – but it’s part of mine. For each Wild Things magazine I write an episode of Owl Kids plus at least one article. I also write word puzzles and devise a board game. First, I think of an idea. Then I draw a rough draft and start testing it on my family. I test it over and over, each time making small changes to the rules until it all works. It’s fun at first, but after several days my kids are begging me please not to make them play the game again! Once the game is devised, there’s still plenty to do. The game wouldn’t be the game without Rob Di Leva, the designer. So when I’ve settled on the final instructions for it and made a draft layout, I send it all to him. At this stage it doesn’t look much fun to play! Rob spends a lot of time and imagination turning each game into something that people would actually enjoy. Here’s what he did with the plan above. Notice that he’s not just a fantastic designer, but a wonderful illustrator. 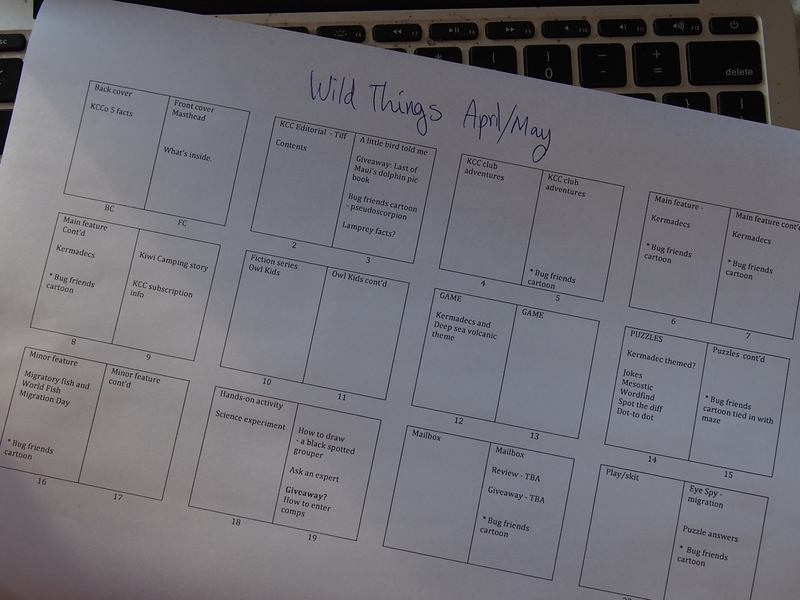 In fact, if you think Wild Things looks interesting and fun in general – that’s all thanks to Rob. While I’m writing and editing, he’s spending hour after hour taking care of the visual side. Behind every good-looking magazine (or book) is a great designer! Okay. Once everything is written, illustrated, edited, and designed, and the whole magazine is almost ready to be printed – one last task begins. Proofreading. 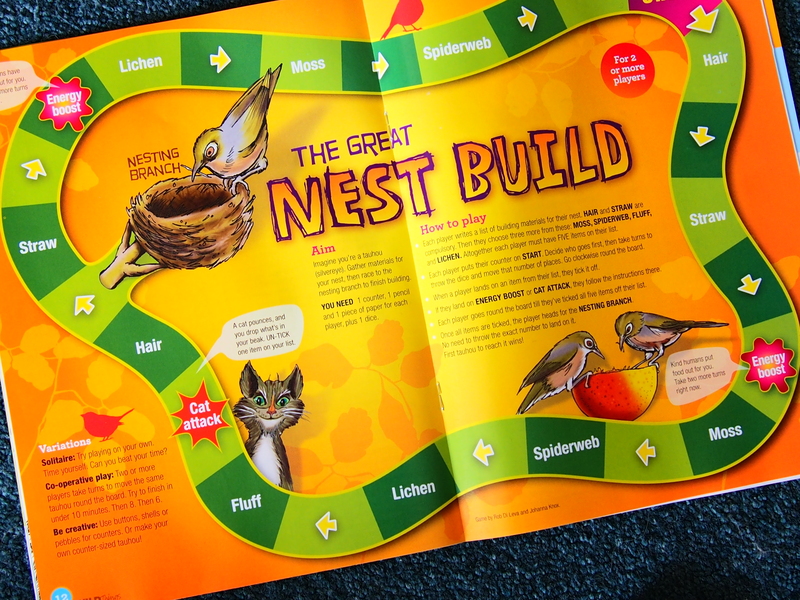 This takes ages, and involves the editor and several others going over and over every part of the magazine to try and make sure it’s absolutely, perfectly, incontrovertibly correct – while the designer fixes all the spotted errors. Now, let me tell you a secret that all editors know. No matter how well you think you’ve done your proofreading, at least one mistake will somehow creep through and end up in the printed magazine. But that is just an example, of course. Have you ever made a class magazine? I love working on magazines, so I couldn’t believe my luck when I got a job editing Wild Things. 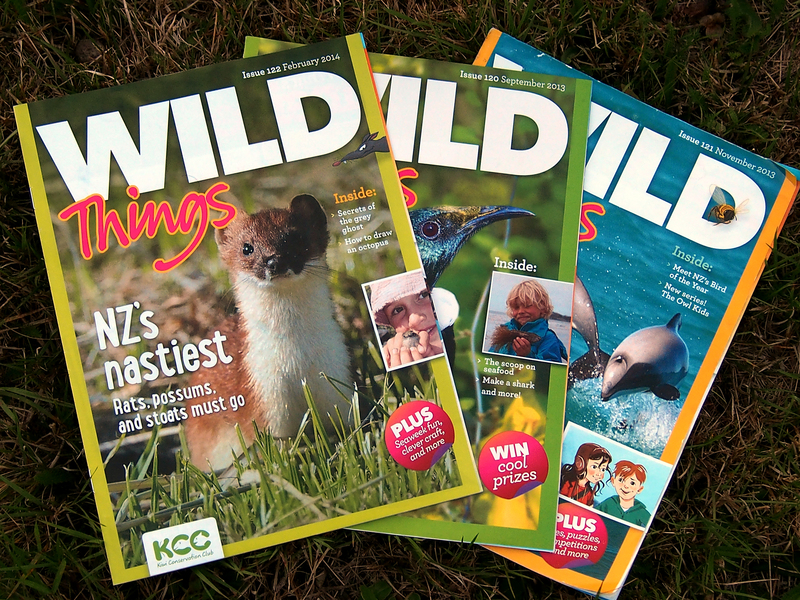 That’s the magazine of KCC – the Kiwi Conservation Club. KCC has members all round the country – kids like you – who get together to have fun and help save the environment. So. What does the Wild Things editor do? I start planning each issue about three months before it has to be printed. Mandy who’s in charge of the KCC website. These four are always having brilliant ideas, as well as hearing important news, so I have to figure out the best way to fit all their ideas and news into one issue. I ask myself: What could we make a puzzle or game or skit out of? What should have an article written about it? How long should the article be? What might we have to leave out, or maybe put in a later issue? I have to remember we have only 24 pages in an issue. Sometimes I wish I could cram in a bazillion and six things – but then the writing would be so tiny you’d barely read it. Yes – you just got a sneak peek at what will be on each page in the next issue. The next step is to see what Tiff, Rob, Marina, and Mandy think of the flat plan. Hmmm … I haven’t shown this one to them yet – you’re the first to see it! I better go show them now. More about how to edit a magazine soon.